After my recent reposts of two pieces I wrote back in 2006, I went looking for a video showing exactly how an eagle flies, hoping it would demonstrate some of the principles I mentioned, thinking maybe I’d find something about the shape of the wing, the aerodynamics of the body, etc. Well, I didn’t find that, exactly, but I did find this cool, two-minute video, done in a wind tunnel, so you can really see, close up the astonishing way the eagle, when faced with a wind, automatically gets in the position to soar. In fact, the wind itself seems to push him into the horizontal position and opens his wings with no effort on the eagle’s part at all — no striving, no worrying about the right moment, it just happens. And once his wings are extended, as the presenter says, “he’s using no force, no effort at all. He hasn’t even once had to flap his wings to keep in this position” and even becomes “totally weightless,” just by the pressure of the wind and the way that God has designed him. Very cool. Enjoy! This entry was posted in Faith Rest, Nature, videos and tagged eagles, Faith rest, nature video, resting, videos on April 8, 2015 by Karen Hancock. When the eagle soars, he doesn’t have to work. The shape of his wings and his momentum are what provide the lift along with the rising air currents. All he has to do is extend his wings and float, so of course he’s not going to get tired. He’s just lying there…Resting. Waiting. Letting other forces carry him along. We like to flap our wings. It feels good and strong to flap flap flap and suddenly, wow! you gain a bit of speed and lift and you’re flying. Only to fall back to earth panting, dazed and exhausted. But oh, that bit when you were in the air – stimulating in the extreme. Flapping comes naturally to us. By contrast the eagle most often begins his flight by jumping off a cliff. The very last thing we want to do! Jumping off cliffs does not come at all naturally. The analogy continues as you consider that the shape of the eagle’s wings is the way God made him to be, tools he’s been given that he had no say over and did not make. For us, that would be all the things God has given us at salvation in the spiritual realm, but most importantly the indwelling of the Spirit and His Word. 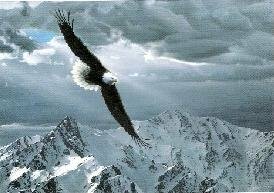 The eagle’s momentum comes from flying – from jumping off the cliff and gliding away. After he has glided a bit, he flaps his wings to gain more altitude so he can float some more. For us, flying would be learning the doctrine (flapping – because it does take effort to learn), believing it, then applying it to the circumstances of our lives. Which leads to rest. So… flapping is learning and applying the word to our lives, while floating is the result of that application. An hour a day reading/studying the Word, 23 hours resting in what you’ve learned. No wonder the soaring eagle doesn’t get tired. This entry was posted in Faith Rest and tagged eagles, Faith, Faith rest, resting on April 7, 2015 by Karen Hancock. I was thinking about soaring eagles and prairie chickens the other day and recalled this card we received last Christmas. I dug it out of my pile of papers and was struck by how relevant it suddenly seemed to me. The fact that the eagle is ALONE is a big one. As is the fact that when he is soaring, he’s not really doing anything, just resting on the wind currents. His perspective is high and far. And even though there are storm clouds all around, there is light bursting through them. Beautiful picture of our life with God. He soars above it all, and below him, far, far out of sight are the prairie chickens — flocking and squawking and chattering. Fluttering, clucking, scratching in the dirt, huddling together, going after bugs and seeds. They find safety in numbers (you only have to fly faster than one other prairie chicken to escape the predator!). Where one goes they all go, often without thought. It’s a horizontal existence and a horizontal perspective. But the eagle lives in the heights. He lives with the higher, bigger, broader perspective. And he is at peace. Ironically, the title of the card is “Peace on earth” and after reading that, it hit me that the only way one can have true peace while on earth is to be a soaring eagle. Is 40:31 Yet those who wait for the Lord will gain new strength; they will mount up with wings like eagles, they will run and not get tired. They will walk and not become weary. This entry was posted in Faith Rest and tagged eagles, Faith, soaring on April 5, 2015 by Karen Hancock. “Do you know know? Have you not heard? The Everlasting God, the Lord, the Creator of the ends of the earth does not become weary or tired… and to him who lacks might, He increases power. (Accipitriformes) as eagles. However, specialized hunting behaviors and physical characteristics like a reversible rear toe have led taxonimists to give the osprey its own separate family. So I don’t think I”m too off using the osprey as an illustration of the eagle. In this video, one not only has the opportunity to watch them soar, but spot the prey and when then they find it, dive: that is, tuck, point the head down and fall. What a metaphor that is. You see it all in this video, and more. I had no idea the kinds of very large prey an osprey can take. Nor that they could actually go completely underwater. Watching God’s creatures, I’m continally amazed at His design. This entry was posted in Faith Rest, Nature, Uncategorized, videos and tagged eagles, hunting, Isaiah 40:31, osprey, resting, soaring, waiting on God on April 17, 2012 by Karen Hancock.